This well-known rhyme lends itself well to using some creative and interactive drama activities with children. It is also useful for young ESL learners as there is a lot of repetition in it. Even though young children may only be able to join in on the first line introducing each animal, the repetition helps build memory and fluency. Instead of simple reading the book – for extra fun and to add a surprise element, before your class arrives, dress yourself up as the old lady using a wig or head scarf, pair of eye glasses, walking stick and your apron of course. As the children walk into class you can delight them with your “old lady” saying things like “I’m hungry, I’m very very hungry- have you got something to eat?” Look around the room, in children’s pockets, in their ears! Children love it! Don’t forget to dramatize your character using a squeaky voice and aching back!! Sit the children in a circle on the floor and set the animal flashcards in front of them. Start telling the story using lots of mime and animation as you introduce the animals encourage the children to indicate the correct correct animal before you swallow it loudly and hungrily and put it in your transparent tummy. For an extra role-play exercise – dress the children up and get them walking and talking and imagining they are 100 years old. Or to imagine how it would feel to have a spider wriggling inside! You could also provide them with their own zip-lock bags and get them to make their own personal animals or finger puppets to put inside. Repeat the story again with everyone choosing their correct animal to eat. Here is an interesting animated version of the story. Many traditional drama games for adults can be easily adapted for teaching children English. The following game is great fun and all my students adore it! It encourages team work, self expression, independence, and quick thinking. Suitable from ages 5 upwards. Call out the name of an object and the group as a whole or split into smaller groups of 4-5 have to make the shape of that object out of their own bodies, joining together in different ways while you count down slowly from ten to zero. Usually the group will find a different way of forming the object. Examples could be: numbers, letters, a car, a number, a letter, a clock, a washing machine, a fire, a happy machine, a sausage machine. Encourage the children to make a sound to accompany their machine or object. One of my children’s favourites is a birthday cake. Some children act as candles we sing Happy Birthday and I blow out the giant “body” candles and the children fall to the ground. Great fun and makes the language memorable. Face Painting adds great excitement and novelty to any Drama class. 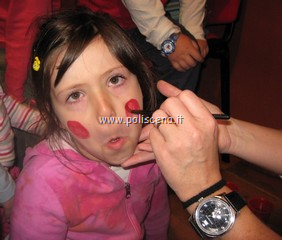 With stage make-up, children finally feel like professional actors! If you are far from being a professional face painter, like myself, I suggest you use very simple creations to maximum effect!! You also should consider “time”, as any group of children will find it difficult to wait patiently and quietly while you create individual masterpieces for each child’s face! 2. Make your life easier by investing in a stage make- up pallet and paintbrush, base pancake and sponges. 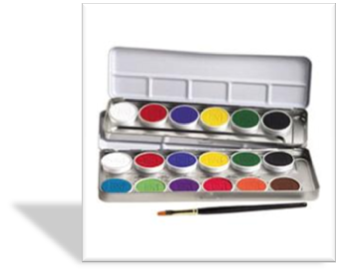 The paints are water based, very allergy friendly and easy to wipe off after. You can also make animal whiskers and moustaches, and rosy cheeks precisely and in seconds. 1. If you have a large class and want to make-up everyone before a show ..try and get the children to arrive early and straight into costume. As soon as one child is ready start making up. So you don’t have a line of impatient children waiting. 2. Also, prepare beforehand what kind of faces you are going to do and for whom so you don’t waste valuable time thinking when you have the children in front of you! 3. Avoid eyes, children don’t like make-up too close to their eyes as they get irritated and start to water. 4. Remind the children not to touch their faces until the paint is dry, you don’t want 20 smudged faces before the curtain even goes up! 5. Get inspiration and ideas for face painting on the internet or try some books here are some from Amazon you could check out. I really like all Usborne books for children and find them really user friendly. Here is an interesting video I found on you tube that could get you motivated in doing something more sophisticated. 1. Put a chair in the centre of a circle of children. 2. Tell the children that it is hot, sticky, covered with paint or glue, cold, soft, has a pin on it, is broken, very comfortable etc. 3. Any child who wants to gets up and sits on the chair. They act out the situation. Eg. If it is hot they sit down and jump up screaming “Ow!”.